October 2016 - Guardian Safety Solutions International, Inc. Ranges or cooktops accounted for the majority (61%) of home cooking fire incidents. “Prevention is the core of our ‘Guardian Solution’ range top suppression system. That’s why we observe fire prevention all year, not just this week,” said Paul Rouse, GSSI’s administrative officer. “The time to protect yourself against a range top fire is before it strikes. By installing the Guardian, you can rest at ease.” He added that kitchens can be retrofitted as well. With the system, a fire can be extinguished in as little as seven seconds (video). 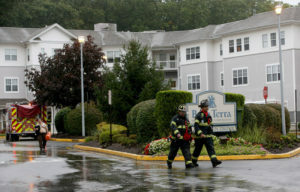 Susan M. Tellem, APR, RN, BSN, Tellem Grody PR, Inc.
A fire at a sprawling senior assisted living facility led officials to evacuate nearly 60 residents on Sunday morning, police said. Jackson police Capt. Steven Laskiewicz said no one was injured in the blaze, which started at 7:15 a.m. and was contained to the third floor. However, the fire caused an evacuation of Bella Terra assisted living facility, located at 2 Kathleen Drive. Laskiewicz said 33 residents were taken to Jackson Liberty High School, while family members picked up another 26 residents. In all, 44 rooms were evacuated. The Bella Terra staff is working on a long-term housing plan for the residents, who lived in Building D.
Jackson police and firefighters from Jackson Mills Fire Company and Jackson Station 55 were the first to arrive on the scene. The flames were quickly extinguished by the sprinkler system, Laskiewicz said. The sprinklers caused flooding in one of the stairwells, police said. More than 20 police, fire and EMS agencies from Ocean and Monmouth counties assisted at the scene. It’s unclear how the fire started. It remained under investigation as of Sunday morning. The fire does not appear to be suspicious, Laskiewicz said.